Editor: PLNU student Stephanie Pinnell approached us to assist her in writing a paper about the campaign to save the Ocean Beach branch library. Stephanie showed us that she is genuine in her concern and passion about saving the “storehouse of knowledge” as she calls it. Her article, published in the campus paper The Point Weekly, comes out the same week that OBceans are urged to attend the City Council budget community-input meeting. The meeting is downtown, on Wed., Feb. 25th on the 12th floor of City Hall, 202 C Street, from 9:00 am to noon. 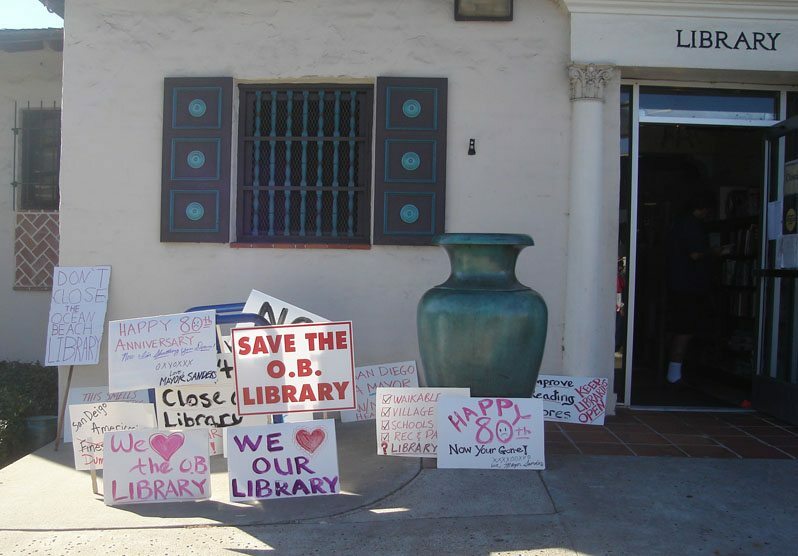 OB residents concerned about keeping our branch library open need to tell the City Council that. On the corner of Sunset Cliffs Boulevard and Santa Monica Avenue resides a historic landmark, one that has served the Ocean Beach community and surrounding areas as both a valuable storehouse of knowledge and a tranquil study haven for over 80 years. This unique site is the home of the Ocean Beach branch of the San Diego Public Library, and today, it faces threats of possible closure. On November 6th, 2008, San Diego Mayor Jerry Sanders announced the tentative closure of the Ocean Beach branch due to budget cuts, along with 6 other libraries, 9 recreation centers and a gym. An astounding response from the community has led to the mayor’s decision to forego the issue and revisit it this spring. “Its closure would be devastating, demoralizing. It would cut out the heart of the community. The library is a necessary part of the community, of society, of peoples’ lives,” said editor Frank Gormlie of the OB Rag, an online blog site dedicated to keeping the community up-to-date with local news. Gormlie, along with the OB Historical Society and the Ocean Beach chapter of Friends of the Library, an organization dedicated to promoting and financially supporting the branch, is passionate about providing a citywide coalition devoted to saving all seven libraries. Members from each of these groups have kept in close contact with District 2 city councilmember and fellow advocate Kevin Faulconer in regards to its protection, and have already sponsored two rallies and acquired hundreds of signatures on petitions in November, in order to obtain additional community involvement. “I have spoken with members of the OB community who have no transportation, and who have no means to travel to another library. For many of these people, the only access they have to computers is at the library,” said Suzi More, who has served as president of the OB chapter of the Friends of the Library organization for the last five years. More also expressed great concern for the many library patrons that are either elderly or disabled, who would have no way of getting to other library locations by foot. The Ocean Beach branch is likewise valuable to the community for its child-friendly atmosphere. It heads several programs, including sign language and story time for babies and preschoolers, as well as a summer reading program for children ranging from preschool to high school. Library closure would mean an end for these programs, as well as a loss of community-specific resources that are available only at this branch. The library’s convenient location, quiet study space and availability to the entire community as a quality resource leaves PLNU faculty and students disgruntled over the current situation as well. Writing and literature Professor Charlene Pate often refers students to the library, specifically for her Children’s Literature class. Libraries are especially important during these economically challenging times, she said, as they are very inexpensive, if not free, to utilize. PLNU sophomore and library patron, Caitlin Skelly, agrees. “The decision [to close the library] would put so many people out of contact with the world. I feel that it’s inconsiderate for them to close a public library when so many people depend on it”. More than a dozen community members have threatened a sit-in if the decision is made to close the library in the “battle,” as Gormlie called it that is to ensue, once again, this spring. PLNU students and Ocean Beach community members have the opportunity to support the cause by e-mailing city council officials directly, or by joining the e-mail library support list through the OB Rag website. Stephanie Pinnell is a student at Point Loma Nazarene University. right on. now this (cross posting, community contributions to the obrag, whatever) is what we should be encouraging with the obrag. The out pouring of community support made a difference in the most recent budget wranglings. It will be needed again. Following the issue on the OBRag is an important way to stay up to date. You also can sign up for email new updates at http://www.supportmylibrary.org. Excellent piece Stephanie. OB- be aware that cuts can also be made by reducing hours and eliminating positions. Hours have already been cut and so have positions. The issue is not simply about closing neighborhood libraries. As someone who spent an enormous amount of time in the OB library in the 1950s, I was shocked to hear that its survival was threatened and very pleased to hear that of its reprieve. Newer Article: Oscar, Progressive Politics… a Sign of the Future of the Film Industry? Bravo!